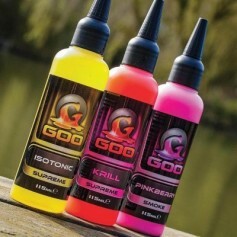 Kiana Carp’s Goo is a soak, a glug and a spod-mix additive, all rolled into one package. 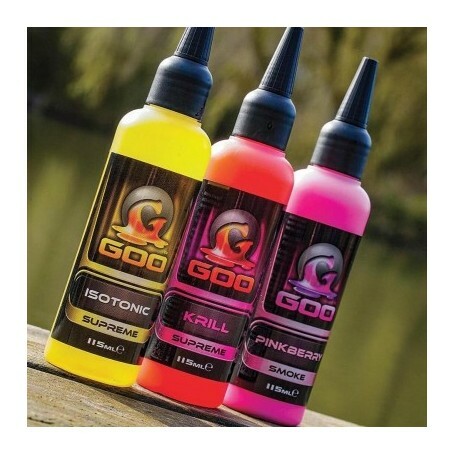 The cloud of attraction that comes off bait treated with Goo has to be seen to be believed, and this is one of the attributes that makes the Goo so revolutionary. But it’s absolutely not the only one. The feeding triggers and flavour combinations housed in the mysterious liquid have been carefully tweaked to provoke a strong feeding response in carp, wherever they are in the water column. The Goo was developed by Loutjie Louwies in South Africa, where it has been used to great effect for many years, leading to the unlikely dominance of the South African national team in the FIPSed World Championships. The lads even gave England a beating in their own back yard, at Linear Fisheries, using the Goo! Loutjie’s close friend, and Carp Team England manager, Ian Huntington, has been given the secret recipes and now makes Goo for the UK market, under the Kiana Carp banner. Korda distributes the Goo – we do not manufacture it!Initially, The Goo has been made available in six variants: Pineapple Supreme Bait Smoke, Raspberry Plume Bait Smoke, Corn Twist Bait Smoke, Tutti Frutti Power Smoke, Perfect Peach Power Smoke, Pineapple Power Smoke. Power Smokes are exactly that, powerful and session changing. A few casts with the Power Smokes in your spod or on your PVA bags will create the most unique cloud of smell, taste and colour and simply send fish into a frenzy around the area of your hook bait.The Bait smokes are slightly softer in colour, but just as effective and ideal for use in almost every situation. They are so natural smelling that their addition really can’t be overdone. Having said that, a bottle goes a very long way! Let your imagination go wild. Soak pellets, mix with water to dampen groundbait to add a unique edge, add Bait Smokes to PVA on their own or doubled up with Power Smokes, soak skinned tigers, glug boilies; the list is long.The only question is, will you be the first to take apart your local lake on it?